Technique of Shooting: Many training sessions incorporate a shooting session. Most revolve around kicking the ball as hard as possible at the net and &apos;hoping&apos; it will go in. Most shooting sessions take place outside the penalty box from distance forcing the goalkeeper to be &apos;shell shocked&apos; from all of the attempts at goal with or without the keeper being prepared. Minimum at best, we do not practice finishing inside the box where a high percentage of goals are scored from! Organization: Two goals in an area of 22 x 20 yds. 2 Goal Keepers and attacking players who are more likely to be in positions to score goals. In the event 2 goals are not available use two corner flags. Plenty of soccer balls. Starting Point: Players to the side of the goal dribble the ball a few yards and then play a diagonal pass across to the other player who is doing the exact action from their side. (To control the session and allow the keepers to rest the ball is played wide from the goalkeeper to the player on the side to start the dribbling action). Play: The players dribbling the ball are to concentrate on delivering a proper pass diagonally across to the other side setting up a shot on goal. After passing the ball, the player is to concentrate on receiving the ball by preparing their approach (run) to the ball in order to strike it on goal. 1 Touch if you can, 2 Touch if you must! On the first pass across the field, pass it to the forward foot in order not to break the stride of the receiver. On receiving the ball, look to adjust your run and body position in order to be facing the goal. If 2 touches is necessary, take your first touch towards the direction of the goal. As a licensed coach, finishing is making sure players receive repetition, but also to encourage finishing in one particular corner to see all players are concentrating on the technique and not just shooting on goal with power. As a coach, teach players how to finish in a particular corner (e.g. far post, bottom corner) with the instep, the laces, the outside of the foot as well as the toe. All important but relate it to how to approach the ball to set the shot up. Demo, Demo, Demo! Paint the picture for the players to execute. Technique of Shooting: Continuation from Finishing Inside the Box Part 1. Now its the ability to turn and finishing on goal. (working on a particular corner). Turning inside the box as fast as possible to surprise the goalkeeper. Play: The players dribbling the ball are to concentrate on delivering a proper pass diagonally across to the other side setting up a shot on goal. After passing the ball, the player is to concentrate on receiving the opposite ball and turning to face the goal in order to strike it on goal. 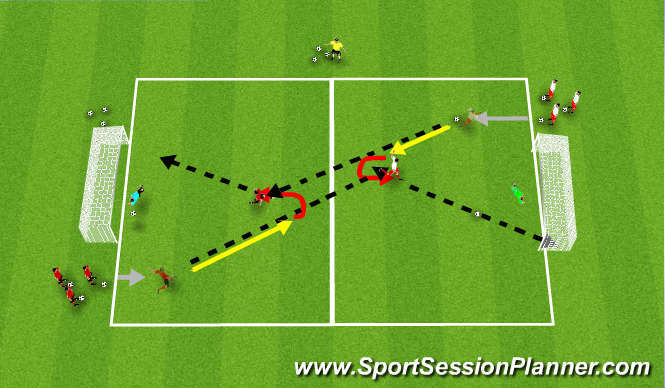 Turn without touching the ball (0 touches) or with 1 touch and finishing in a particular corner! On receiving the ball, can you turn with the instep tight, or is it necessary to turn with the outside of the foot or does it require a movement of ball manipulation. 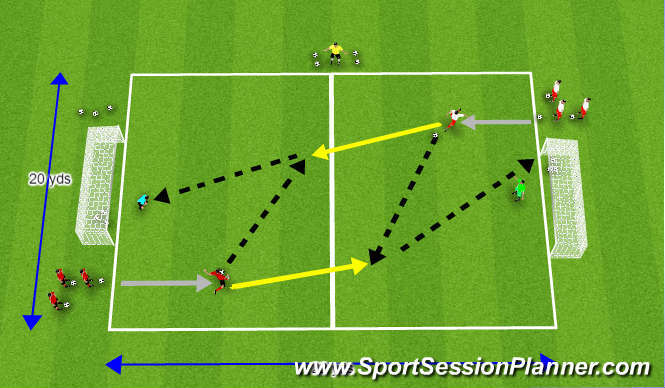 (each can be worked on in isolation or allow the player to make a decision based on the pace of the ball, area of the box or approach to the ball). Players are to be encouraged repetitively to scan the space/time behind them by looking over their shoulder. Look to adjust your run and body position in order to be able to turn with minimal touches and hit the goal. As a licensed coach, teach players how to finish in a particular corner (e.g. far post, bottom corner) with the instep, the laces, the outside of the foot as well as the toe. All important but relate it to how to approach the ball to Turn with minimal touches as fast as possible to set the shot up. Demo, Demo, Demo! Paint the picture for the players to execute.